This article explains some easy tips on how to organize your bathroom; most of us dont have baths that are as large as we would like. In a nutshell, every inch counts. The trick is to balance functionality, ease of use and navigation, and aesthetic qualities. An organized bathroom tends to be more sanitary. The process of organizing this space makes the job of cleaning it much easier. Finally, decluttering on a regular basis eliminates many health hazards. The worst space-wasters tend to be apartment baths but many older homes have issues as well. In apartments and rental homes structural changes are out of the question unless you have an understanding landlord. Seen many of those lately? I didnt think so. Paper goods such as Kleenex and toilet paper. Old storage items that you do not use, or do not enjoy using. These are prime space-wasters. Grooming items such as nail files and razors. Cleaning supplies; most likely many of these can be relocated to a closet or cabinet elsewhere. Over the counter creams and pills. Anything that has been sitting around and unused for a year. Hair paraphernalia such as brushes, combs and clips. Decluttering is an important first step. It will reveal what youve really got to work with and will point out problem areas when it comes to cleaning. All that is needed to declutter your bathroom are sturdy plastic trash bags, disinfectant cleaning wipes, paper towels, and whatever other cleaning products you like. After banishing all non-bathroom items, it is time to begin organizing what is left. Most bathrooms are set up somewhat differently. Depending on you particular setup and what you already possess, you might not really need new organizing or storage products. If your bathroom is deficient in storage options, like having a pedestal sink with no storage space underneath, if your countertop is miniscule or non-existent, or there is no closet or shelves, plan what you will need to buy. In determining what items you will need, first take stock of what items you want to store and organize. Take time to balance between wants and needs. If you enjoy having a lot of bulky things such as bath towels and packages of toilet paper, consider a piece of furniture such as a chest or shelving unit. If you are on a strict budget, or if you are dealing with an unusually shaped room, several large square baskets might be an excellent solution. But if you already have a place for the big stuff but struggle with smaller items, you will need smaller containers that do not take up much room but will allow you to stash little things where you can conveniently reach them. Be sure to shop for organizing products with a good understanding of your unique needs and not simply a vague idea of what you imagine might work. If you are awed with a designer bathroom on Pinterest but your own space is more modest, just brainstorm and take the elements that will work for you, such as the calming color scheme and put the ones that dont out of mind. When you are shopping for bathroom organizers, focus on the ones that will serve to maximize the space in your bath. Look towards reducing the time you spend poking around in drawers and rummaging through closets. Bulky storage boxes that feature heavy lids might look nice but are impractical in use. Be sure that you measure your bathroom carefully to ensure that you are not purchasing things that simply will not fit in your space effectively. In many homes, linen closets are right on top of the list of the least favorite household spots to tackle when organizing. Why? There is always a lot of folding involved, a large collection and at times bizarre range of things to search through, and in many cases shelves far too high to reach without dragging out a ladder. As you might imagine, part of your planning is to decide exactly which things you feel comfortable storing in the closet and which to keep in the bathroom itself. Once you have decided what to leave in the closet, arrange everything such that the most frequently used things are front and center. Group your smaller things logically in storage bins or boxes. Arrange items such as towels easier to locate by grouping them by size, color, in sets, or whichever makes sense for you. That being said, keeping your hair products, razors, body scrubs, and whatever else you find essential within easy reach is a must. Any organizers you use in the shower should be very stable; Look for high-quality soap dishes that suction cup to the tile wall and tall caddies that stand perfectly upright in the corner of the enclosure. Of course your shower may be overly-packed full of bath products due to your being high-maintenance of a multitude of family members with their own unique needs. In this case think about streamlining your routine, or storing rarely used things somewhere else. Many bathrooms have no counter space, but but even if yours does it is a good idea to keep as few items perched on it as possible. First, this will make your counter easier to wipe clean. Second, it minimizes the chance of other items creeping in to join those already there. (This is generally an insidious process.) Finally, a bare counter just looks better. But if you are of the mind that everything should be visible, or like to display your wide assortment of exotic beauty products, you can do it, just know that it will require a much more time and effort to keep everything clean and neat. When you organize your things on a counter, focus on keeping them closest to where they are used. For example, hand soap needs to be right next to the sink. You might even like to store often-used hand lotion there as well. And, just as with your linen closet, keep infrequently used things towards the back or the side of the counter and out of the way. Many bathrooms have a recessed medicine cabinet above or next to the sink. If yours does, reserve it for items you use the most often, such as daily medications, toothpaste, or eye drops. A medicine cabinet is a good location for items you use almost but not quite as often as the few things you keep right beside the sink. But it goes without saying that how much you keep in a cabinet above your sink is dependent upon its size; a smaller, old-fashioned cabinet will hold just the bare necessities but a more spacious modern one can easily fulfill most of the functionality of drawers or a large vanity counter. If you are fortunate enough to have cabinets located under your sink, these can be a good choice for storing extras such as toilet paper and toothpaste. These cabinets are always an excellent location for your bottles of cleanser, sponges, as well as other cleaning items. Your bathroom drawers are out-of-sight, out-of-mind so how you fill them is entirely your decision. Just ensure that they do not become junk drawers where various unclassified things go to suffer a slow death. Keep in mind that just since you own a multitude of drawers, that does not mean you have to fill them all up. If you are in love with the concept of a minimalist bathroom, feel free to ignore your drawers. However, if your bath is short on cabinets and drawers, consider how you can utilize your vertical space, perhaps shelving units or floating shelves above your commode or towel bar, to store necessities. If you are blessed a vanity (as we all should be), you certainly already have a good idea of which parts of your morning routine that you prefer to do there. Ladies should organize their makeup and skin and hair products as they typically use them. If you live in a dry climate and moisturizing your face is a basic part of your shower routine, locate your moisturizer on your bathroom counter or close by in the medicine cabinet. But on the other hand you consider moisturizer as a part of your makeup application, locate it along with your other makeup products on your vanity. Keep the tools that go with the products along these lines too, for example makeup brushes with makeup, exfoliating gloves with body wash, and on and on. As soon as you get your bathroom organized such that it feels comfortable and works for you, it will be a snap to keep it on track. Of course you will have to put in some effort. Become disciplined about returning things to their proper spot after using them. 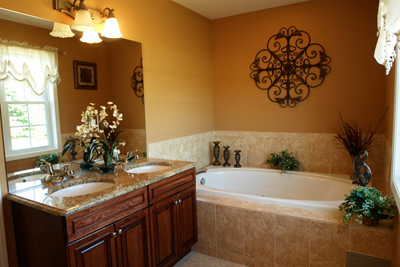 Avoid letting items that live elsewhere accumulate in your bathroom. This pattern of maintenance should be done as a part of your daily routine or whenever you clean up. Because bathrooms are usually relatively small and are easily divided into manageable areas such as the shower and counter, it is an easy task to organize any bathroom quickly. Thats all there is to organize your bathroom. Not rocket science, just patience and attention to detail! Got some tips to share? Use the comment box below.